“CatWalk” was an enterprise to blur the boundaries between different study disciplines: Fine Arts and Textile Arts – to encourage the participating students to collaborate and to exchange ideas. The very first association of Cat Walk linked to the fashion world was to be re-thought. The body politics for example was one topic that has been referred to. As it was pointed out: “The challenge was to turn CatWalk into something else than an ordinary fashion show by reviewing, extending, twisting and questioning it”. The workshop has been accompanied by readings and film screenings followed by discussions and back to studio practice. 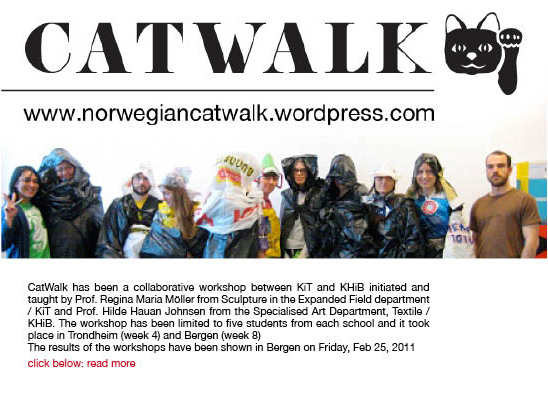 The participants also attended various lectures and cultural events in Trondheim and Bergen.